Work is a formal contract. Employees dedicate their time and expertise to fulfill a set role or task. Employers compensate workers for their time with a monetary wage. In an ideal world, both parties profit from the arrangement. Refusing to pay them altogether. Handing over a non-valid check. Refusing to give paid breaks where legally required. Paying under the federal, state, or county minimum wage. Having employees work off the clock. What do you do when you realize your boss isn't properly compensating you? The first thing you should do is document the problem. Make a copy of your pay stub. If you have access to the time management software the organization uses, print the reported hours worked. Begin documenting any past or ongoing "bad" behavior. The next step is to check with the company. It might just be an honest mistake that can be remedied quickly. If you're currently an employee, talk with human resources or a manager about the problem. They can direct you to the right department if they can't help you themselves. If you're a former employee, you might try contacting a former manager, human resources, or a general contact email about pay discrepancy. If the company won't respond and won't pay you for all hours worked at the right wage, there are steps you can take to potentially recoup all or some of the money. There aren't, unfortunately, any one-size-fits-all solutions to this problem. 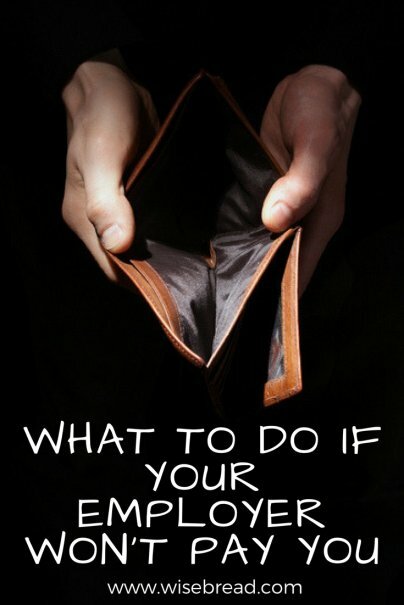 There are, however, a variety of strategies you can try to force your former or current employer to compensate you properly. Reporting wage theft is highly dependent on the individual state. Every state has slightly different laws and procedures to help employees report and recover stolen wages. First, you can file a wage claim through your state's Department of Labor. If you go this route, state department of labor investigators will look into your case. This may seem like the most obvious and easy route, but it can be a long journey that might be doomed to fail. Recently website Politico reported that six states had no investigators to look into wage violations, and 26 states have fewer than 10 investigators. The end result is that many individuals who report wage claim violations to their state never see their money. An alternate option is to file a civil complaint in court against the business. The court that the complaint is filed with depends on the monetary amount. If filing a complaint at the state level isn't a viable option, individuals can file a complaint with the Wage-Hour Division of the U.S. Department of Labor. According to Politico, the department has about a 90 percent success rate in recovering stolen wages. The success rate does seem impressive, but it should be noted that the department is very selective on the cases they take on. Investigators at the department don't accept every claim that comes through the door. And unfortunately, even if they do take on your case, don't be surprised if they can't recover all the money that you're owed. The U.S. Department of Labor can only recover the federal minimum wage. That means if you should have been paid above the federal minimum wage, you still might be looking at a significant loss. If you belong to a labor union, take the case to union representatives. They should, at the very least, point you in the right direction. The union might even be willing to file a grievance on your behalf if they believe the case is strong enough. If the wage theft is widespread at the company, employees might be able to band together to file a collective action complaint. A collective action complaint allows groups of employees with similar Fair Labor Standards Act (FLSA) wage violations to file a complaint against the company together. A collective action complaint, unlike a class-action lawsuit, requires employees to actively sign onto the lawsuit in writing. Employees that don't consent to join the complaint won't benefit or be bound by the ruling. Collective action complaints must be filed, in most cases, within two years.